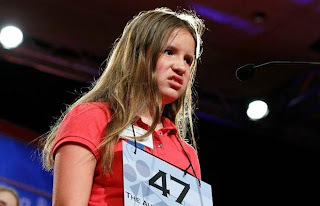 I'm watching the Scripps National Spelling Bee...on TSN. Did you catch that, The SPORTS Network. I'm a mid-twenties gal, home on a Friday night to watch kids (ages 8-15) spell words. It's the best television ever, who needs "reality" tv when you have this. The intensity and seriousness of it is remarkable, this is the finals people. And the commentators are hysterical...especially the chick (who is dressed to the nines, blonde hair extensions and all) that interviews the heartbroken children who misspelled their word by one letter...or, as in the case of the one Canadian contestant, she just couldn't hear correctly. The commentators remind me of those in golf games, speaking in very hushed intense tones, mostly saying filler and nonsense. Meanwhile, I've typed at least 5 words from this post into google search just to make sure I'm spelling them correctly...even that, Correctly...1 'r' or 2, I had self doubt and had to double check. How do these kids spell these crazy words in front of parents, judges, opponents, and on television! (I had to look up opponents). our Canadian Laura Newcombe after being eliminated for spelling “confiserie” c-o-l-f-i-s-e-r-i-e. The ironic part is that it's a french word and Canada is a billingual country; both French and English are our official languages, eh. O Canada. Here is trailer for the Spellbound documentary. Soo good!